Today is Leonard Peacock's birthday. It is also the day he hides a gun in his backpack. Because today is the day he will kill his former best friend, and then himself, with his grandfather's P-38 pistol. But first he must say good-bye to the four people who matter most to him: his Humphrey Bogart-obsessed next-door neighbor, Walt; his classmate Baback, a violin virtuoso; Lauren, the Christian homeschooler he has a crush on; and Herr Silverman, who teaches the high school's class on the Holocaust. Speaking to each in turn, Leonard slowly reveals his secrets as the hours' tick by and the moment of truth approaches. Matthew Quick just gained another fan right here and I know there will be others out there. After the success of THE SILVER LININGS PLAYBOOK, it is difficult not to expect further from him, and readers will not be disappointed. His new book, FORGIVE ME LEONARD PEACOCK, is sure to capture readers’ interest. Quick knows his words, his language, and his readers. So, it was not difficult to follow Leonard Peacock’s story. I was right there in Leonard’s head reading his thoughts and living them. I felt him. It was not an easy place to be, but Quick gave Leonard a voice that people can relate too; even his inexcusable behaviors. Leonard’s psychological issues were carefully laid out with respect and exactness. The craziness was a balance between confusion and intellect, it was believable. The footnotes were tangent stories to back these all up. Quick used a candid approach on a very complicated issue, without avoiding the most sensitive language or the use of occasional graphic content. I will not be surprised if they shelf this among the banned books, like The Perks of Being a Wall Flower. It’s not a difficult read, but heavy on the content. I have to make it clear though, those books like this CAN SAVE LIVES. If schools ever have Teachers’ Required Reading Material, this should be among them. And parents shouldn't be excluded from that assignment either. Obviously, our author made a thorough research to make this book worth reading. The authenticity of a teenager’s life in and out of school is vivid here. It’s an encouragement on how teenagers can survive the trials of their age and circumstances; and that adulthood can only be miserable if they let it be. In here, the revelations are not surprises, but instruments to drive the life-saving lesson of the story. If you are looking for a book worthy of your time and thoughts, FORGIVE ME LEONARD PEACOCK is the right read for you. I really enjoyed reading this, and hope that you will too. *To Little, Brown Books for Young Readers and Netgalley, thank you for giving me a chance to read this in exchange for an honest review.This review is also available on Goodreads and Tumblr. 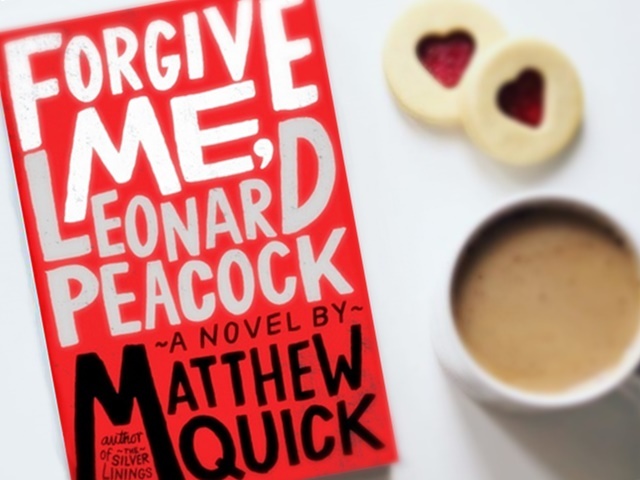 Oh, so Matthew Quick has a new book out! Woot woot! I hope our bookstores stock it soon!